A variety of art will be on display during an upcoming Estacada holiday tradition. The eighth annual Estacada Winter Artisan Show is scheduled from 5-8 p.m. Friday, Dec. 7, and 10 a.m. to 5 p.m. Saturday, Dec. 8, at Estacada City Hall, 475 S.E. Main St. Along with a selection of art, it will also feature live music from the Estacada High School Troubadours, art demonstrations and raffles and selections from a local winery. Those involved with the event are looking forward to it. "It seems like it gets a little better every year," said Phil Lingelbach, noting that work from approximately 20 artists around the region will be featured, and styles are representative of the Pacific Northwest. This year's featured artist is Brightwood printmaker, photographer and book artist Sue Allen. It's Allen's first year at the Winter Artisan Show. She describes her work as "wild and tame," noting that she takes frequent inspiration from nature. "I love native plants and birds," she said, adding that she also participated in the Powerhouse Project several years ago, which allowed artists to tour powerhouses on the Clackamas River and create work inspired by their experiences. "(The powerhouses) were built in an insightful way. You're taming the wild." 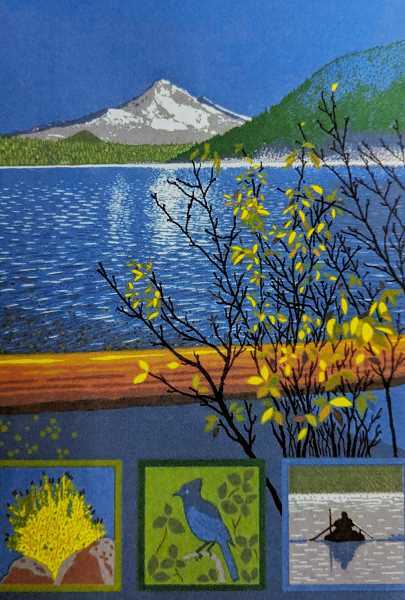 One of Allen's favorite pieces she'll have in the Winter Artisan Show is a screenprint called "Oregon Sunshine," which features a sunflower with Mt. Hood in the background. "I love Mt. Hood in particular. I love mountains," she said. Lingelbach said Allen's work will complement other pieces in the show. "With Sue, she's a nature artist from the area and she's well known outside of Estacada," he added. The dynamic nature of the Winter Artisan Show is another key element of the tradition. "We're always looking for new art. We always want to have something that will amaze and inspire you," Lingelbach said. Another goal is to bring a variety of visitors to Estacada. "We want Estacada to be identified as a community with outstanding art," said Lingelbach. When: 5-8 p.m. Friday, Dec. 7, and 10 a.m. to 5 p.m. Saturday, Dec. 8.